The age of the restaurant self-service kiosks has dawned, and it's the end of fast food as we know it. 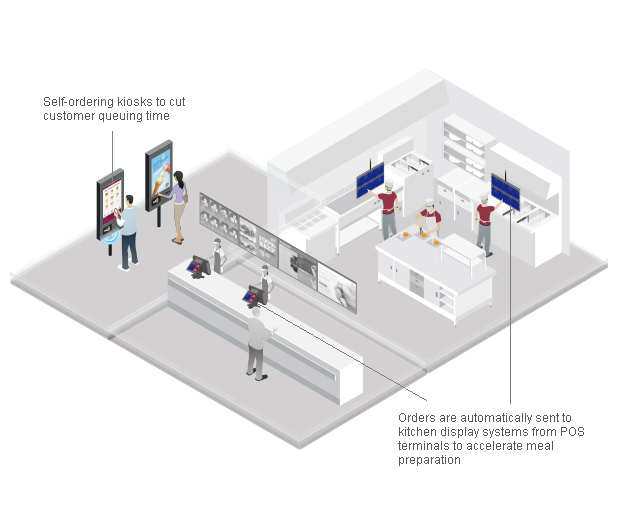 Self-Ordering Kiosk is striding into the 21st century with the rollout of the "Create Your Taste" touchscreen kiosks, on which custom Food and Beverage can be built as well as full-menu ordering. The kiosks are incredibly convenient and improve order accuracy. NEXCOM Restaurant Kiosk Solutions include KPPC (Kiosk Panel PC) series for self-service, KDS, self-ordering, queuing applications. NPT (NEXCOM POS Terminal) series are for POS terminal, food & beverage QSR, restaurant, hospitality and CVS retail stores. Kiosk Panel PC KPPC-1812 is the next generation Kiosk Panel PC. It will help you to build a smart future-proof kiosk that can evolve with changing needs of retail and hospitality industries. Based on Intel® Celeron® J1900 processor, the KPPC-1812 can power multimedia contents for advertising and enable multiple ways of user interaction for self-servicing. 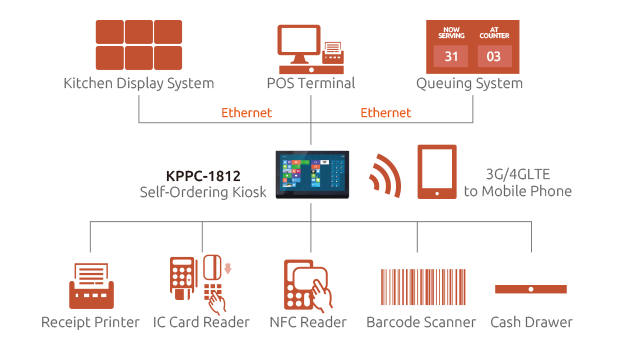 The KPPC-1812 is designed with expansion flexibility and ease-of-use and maintenance and can maximize kiosk uptime and lower total cost of ownership (TCO) for users. 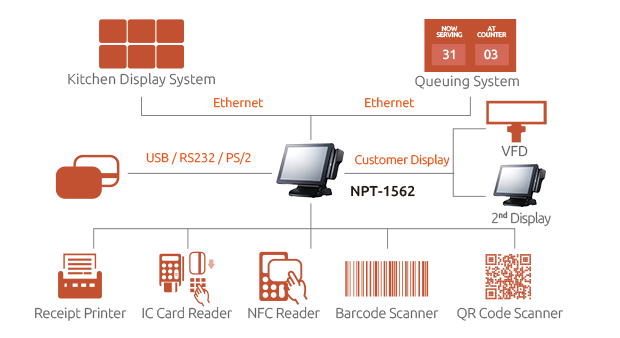 The NPT-1562 is a high value Point-of-Sale (POS) hardware solution designed to fulfill your POS hardware requirements. The quiet fanless design offers low power consumption and minimal maintenance. To reduce maintenance time and costs it comes with a removable HDD, MSR, fingerprint and VFD kit. The DC-12V output provides sufficient power for a second display from the POS terminal, as well as providing better cable routing and high-integration. The small footprint is ideal for installations where space is limited. The VESA mounting design of the Display Head, is only 100x100mm and provides an option for wall-mounting when detached from its stand. It is also spill resistant and offers a high degree of integration for POS peripherals, thereby ensuring continuous operation in restaurant and retail conditions. NEXCOM NPT series of POS terminals are intended for food & beverage, QSR, hospitality, and CVS retail industries. The NPT series of POS terminals has low power consumption and requires minimal maintenance. The NPT series comes with a removable HDD, MSR, fingerprint and VFD kit. The NPT series has a small footprint ideal for space-saving installations. NEXCOM’s KPPC series of Panel PCs are restaurant kiosk solutions designed for self-ordering and KDS applications. NEXCOM’s KPPCs power the self-service kiosks to provide a complete digital service counter experience from start to finish, helping restaurants serve more customers, reduce wait times, reach out to a broader customer base, and therefore increase revenue.